Welcome to the IM Campus Leagues at Sport Sheffield! Here at Sport Sheffield we have one of the biggest IM programmes in Higher Education. This is played at a recreational level, however there is a friendly competitive edge involved. Fixtures are played right the way through the student academic calendar. We have 11-a-side football, 6-a-side football, 5-a-side football, netball, small sided hockey, touch rugby and squash on offer. Goodwin Sports Centre is our flag ship facility hosting 1 full size synthetic turf pitch, 4 small sided synthetic turf pitches, a multi-purpose 638sqm sports hall, swimming pool, bouldering wall, 4 squash courts and the superbly equiped S10health Fitness Centre. 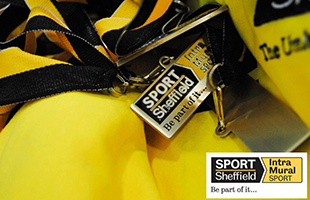 Please visit www.sport-sheffield.com for further information.